Industrial: The state’s industrial real estate market, including warehouse space, boasts a 5 percent vacancy rate, which is up slightly but still strong. Retail: Despite the fact that the retail and restaurant sectors have struggled nationally, this type of space remains hard to come by in Colorado. The market enjoys a 5.6 percent vacancy rate. Office: Demand for office space started slowly this year, according to CBRE’s research, but it’s starting to bounce back, especially in downtown Denver. The statewide vacancy rate for office space sits at 12.8 percent. Regardless of what kind of commercial real estate your company is involved with, Burg Simpson’s experienced Colorado commercial litigation lawyers can help. We have experience in handling disputes arising from real estate transactions and events affecting property, including purchase and sale contracts, insurance, environmental contamination, construction, land use, zoning, and boundary or surveying disputes. Our attorneys advise and represent clients in all aspects of real estate disputes, including failed real estate transactions, easements, rights of way, nuisance claims, zoning, and leases. If your company is caught up in a dispute over real estate or land use, call 303-792-5595 to discuss your case with a Colorado commercial litigation attorney at Burg Simpson as soon as possible. Buy-sell agreements – We have represented both buyers and sellers in real estate deals. Commercial leases – Burg Simpson has experience working with both tenants and landlords during negotiations. Disputes – We have experience negotiating both construction and commercial real estate disagreements. Inspections and assessments – Finally, we can help our clients sort through all of the various inspections that commercial real estate properties typically face. Commercial real estate is an expensive, volatile market. Burg Simpson’s Colorado corporate litigation attorneys have handled hundreds of commercial real estate deals, from both sides of the table. If your company is looking to buy or sell a commercial property, do not do anything without talking to a Colorado corporate litigation lawyer at Burg Simpson at 303-792-5595. Our Colorado commercial litigation lawyers can work with local municipalities and help our clients navigate complex zoning issues. Call Burg Simpson at 303-792-5595 to discuss your case with us today. Every real estate transaction entails varying degree of disclosure among the parties. Disputes can arise both during and after the transaction, especially since Colorado law imposes fewer restrictions on the parties in a commercial real estate transaction. For example, Colorado commercial real estate sellers are not obligated to disclose defects as long as buyers are allowed to inspect the property in question. Nevertheless, sellers still have to be honest in any disclosures they make, otherwise, they risk charges of misrepresentation and/or fraud. Our Denver corporate litigation lawyers are experienced in handling disputes arising from disclosure matters in real estate transactions. Call Burg Simpson today at 303-792-5595. The business lawsuit lawyers at Burg Simpson have specialized experience in these areas, including failure to disclose adverse material facts, failure to advise clients to seek expert advice, and earnest money disputes. Contact Burg Simpson right away at 303-792-5595. 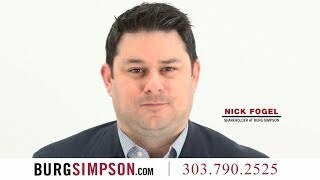 Call Burg Simpson today to speak with one of our Denver corporate litigation lawyers. We can work with you on evaluating your case and show you the best way forward. Read more about our award-winning construction litigation defect team here. Commercial real estate transactions are frequently more complicated than they appear. Problems can crop up in the form of title defects, mechanics liens, and cumbersome zoning regulations. 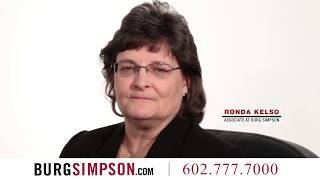 Burg Simpson has decades of experience in handling commercial real estate cases. Don’t let arbitrary lender requirements or a volatile commercial real estate market threaten your business. 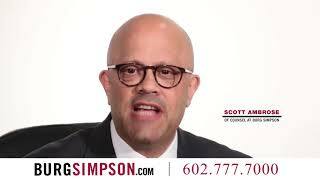 The Denver corporate litigation lawyers at Burg Simpson can help. Please call right now at 303-792-5595 so we can ensure your company is protected and well-represented.